I am in no way a horror connoisseur, in fact I'm pretty sure I scare more easily now than I did when I was a little girl, and I scared fairly easily as a child. You might think I'm exaggerating, but I don't even like to watch Shaun of the Dead on my own; I hate dead, decaying things and the noises zombies make are enough to give me nightmares for weeks, and there was that time when I was about eight years old that my family watched I Know What You Did Last Summer - a film I ended up watching with them, probably because I was too stubborn to go to bed - and it terrified me that much I haven't been able to watch it since, which is ridiculous considering it's just another teen slasher movie. I'm not hysterical - the Scream franchise doesn't bother me and I really enjoyed The Cabin in the Woods - but I have an overactive imagination which likes to frighten me even more when I'm tucked up in bed and all the lights are out. Sometimes, though, I like scaring myself. I think we all do, otherwise why would the horror genre exist? I'm not big on gore - I'm not all that squeamish when it comes to blood and guts, thanks to an upbringing filled with a lot of historical dramas where people were hanged, drawn and quartered left, right and centre - mainly because I think psychological horror is so much more skilful. I think frightening people with a gratuitous use of violence is a rather neanderthal approach to horror. I've always loved ghost stories, though. I've been fascinated by ghosts since I was very young, and when you grow up in Yorkshire it's hard not to find them all the more interesting; York is said to be the most haunted city in Europe, if you like to believe in that kind of stuff (which I do). 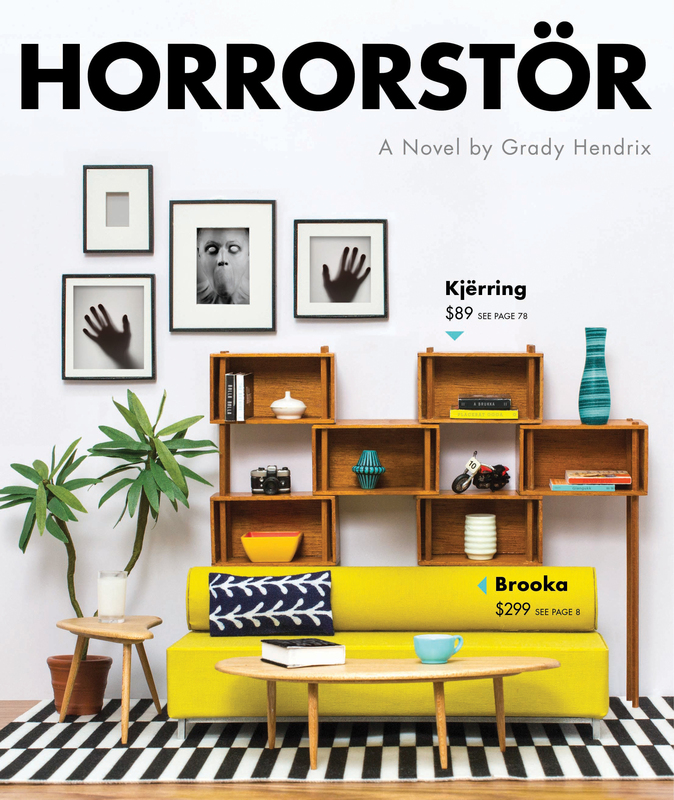 I love haunted house stories in particular, so when I stumbled across Horrorstör, described as a haunted house story in a department store, I had to have it. Orsk is a furniture superstore that's not quite IKEA - it's cheaper, and the furniture's not quite as good - but it's certainly trying to be IKEA. Bless it. At this particular superstore, however, things are becoming a little odd. Sales are down despite customers constantly buying, and every morning employees arrive to find mirrors and cabinets destroyed and a pungent, swamp-like smell seeping into some of the furniture. Recently the employees have been receiving one word text messages from an unidentifiable number: help. Our protagonist, Amy, hates working in retail, but life hasn't been kind to her these past few years. Add to that a feeling that the world owes her something and she's not a happy bunny. She can't stand her manager, Basil, who seems to think Orsk is the centre of the universe, but when he offers her extra money and a transfer in exchange for her to work an overnight shift with him and one other employee, Ruth Anne, to find out who's breaking into the store, she agrees. And that's when the trouble really begins. The first thing I have to say is that I LOVE the way this has been published. The book is formatted to look and feel like a department store catalogue: inside there are diagrams of the furniture, a map of the store, adverts for upcoming sales and even an order form. It's adorable, and I love it when publishers put effort into the way a book is produced. I'm glad to own this book just so I can take it off my shelf and go 'LOOK AT THIS IT'S LIKE A CATALOGUE'. Reading Horrorstör felt like reading a horror movie. It doesn't mess around, it just pulls you into the story; like many horror films all the action takes place over the course of one night, and all you have to do is sit back and see who survives. I loved the idea of a haunted furniture store - a haunted house story 'for the modern age' (though considering we still live in houses I'm not sure what to make of that statement) - but sadly I was a little disappointed by it. I was looking forward to discovering why a furniture store was being haunted; was it going to be a secondhand furniture store full of misplaced ghosts from other houses, or was it going to be something completely new? Instead it went down the (in my opinion) over-done route of a building 'built on haunted ground', which I thought was a shame. I didn't hate it by any means, as you can see by my rating I enjoyed the book, I was just hoping for something a little different. I wanted the characters to succeed - Amy, Basil, Ruth Anne, Trinity and Matt are all people you don't want to see get hurt, unless you're particularly sadistic - but sadly I didn't feel totally connected to them. Like I said, reading this felt like watching a horror movie, a movie like Scream or I Know What You Did Last Summer, where the characters could be characters from any other 'try and survive the night' story. There were little sections that fleshed them out, but I would have liked to have known them better because what I did discover I found pretty interesting. Amy in particular isn't the typical sweet and virginal heroine you usually find in the centre of horror stories, and that made for a nice change. One thing I must say is to stay away from this if you're not a big fan of gore. I was a teensy bit disappointed that Horrorstör seemed to rely more on physical horror than psychological horror for its scares. It's nothing hugely gratuitous, but if you find the description of someone's fingernail peeling off 'like a wet stamp' then you might want to give this one a miss. So, I didn't love this book but I did like it. It's a great read for this time of year, and it's also a great read for readers who really like horror movies; if you're a big fan of slasher movies or games like Until Dawn I think you'd like this book, and even if you don't end up loving it I think it's so fun to have it on your shelf because it's testament to what publishers can create. It's a cool concept, and there are certainly parts of it that are very well done, but I think it could have been better. This actually sounds awesome! I love horror and this one looks so cool! I definitely need to get a copy! I do love gore in my books, but I prefer psychological ("quiet" horror as I named it in a discussion) horror over "jumpy" horror. It's just that it plays with your emotions, and to be honest, I feel like it's more scary. However, I love all kinds of horror books so I don't really mind. I'm excited to try this book out. Heard good things, and what you said about the format makes me want to read it even more. As for the actual book... hmm. I am not sure! I mean, on one hand, it does sound kind of intriguing, and I like the concept, but I also don't love the gore. Or the overused tropes. But.. like you said, it's worth having on the shelf :) Great review! Top Ten Tuesday | Recommended Halloween Reads!